Furka Pass (el. 2429 m.) is a high mountain pass in the Swiss Alps connecting Gletsch, Valais with Realp, Uri. The Furka-Oberalp-Bahn line through the Furka Tunnel bypasses the pass. The base tunnel opened in 1982 and replaced a tunnel at 2100 m.
The Furka Pass was used as a location in the James Bond film Goldfinger. The Furka Passis another stunning 5 star pass in the central Swiss Alps, part of the “Big 3” interconnected passes close by to Andermatt. 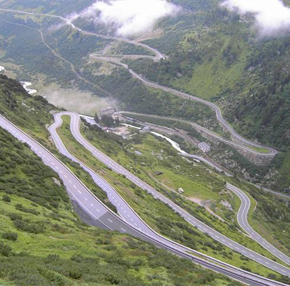 The Furka Pass also takes you within a few hundred meters of the Rhone Glacier, source of the Rhone river. Here you can park up and walk up to and actually inside the glacier itself. Although the glacier has retreated dramatically in recent years, it still really is an incredible site, around 7KM in length. From Gletsch the Furka Pass starts with a couple of tight switchbacks, but then cuts a long sweeping path along the rock-face of the valley for around 5 to 6 KM. Visibility forward is fantastic, roads surface immaculate, so it’s a road that you really can “drive” and really puts a big smile on your face. At the end of this initial stretch, you then turn back on yourself, the Furka Pass then gets steeper, with a series of great switchbacks (road surface here is not so great and quiet often can be small rock debris on the road from the steep walls the road has been cut into) up until you reach the Hotel Belvedere, iconic site close to the top of the pass. The run down the Furka Pass is not quite as exciting as the road narrows and can be quiet steep in places, but does give great views all the way none the less. Once at the bottom of the Furka Pass, there is a 4-6KM streth of road, arrow straight, running parallel to the railway line, be careful…….